For the past few weeks I’ve been dealing with a leg injury. It started out as a combination of things – a very sore ITB, outer hamstring and lower quad. Cause? Probably a combination of running a half marathon and then bashing my legs about at Tough Mudder in the space of 3 weeks. It had been niggling for a while and not getting any better so I took myself off to the physio. After some painful treatment he prescribed ice, stretching and rest. Definitely no running, definitely no jumping and definitely no weights. Hmm what to do? With my lower body effectively out of action I decided to take the opportunity to concentrate on my upper body and core. The great thing about having followed Julia Buckley’s fat loss fitness programme is that I now have a whole range of exercises at my fingertips and know how to adapt them if I need to. So for a few weeks I concentrated on lifting heavy with my upper body – back, shoulders, biceps, triceps – they all got a good workout and I set some personal bests during this time. Yoga has been my saviour many a time when I’ve been injured and this time was no different. Clare Dobson and Adam Hocke, two of the fabulous teachers at Good Vibes both gave me a number of stretches to do at home which would help with my problem areas. So I’ve been diligently getting into pigeon pose of an evening and hanging out there for a while. It’s not particularly comfortable but I can feel it working it’s magic on my hips and glutes. Thankfully my leg started to feel better and while I didn’t want to risk running or anything high impact I decided to try it out at a Reformer Pilates class. Pilates is a low impact form of exercise which I’ve found to be fantastic for core strength. 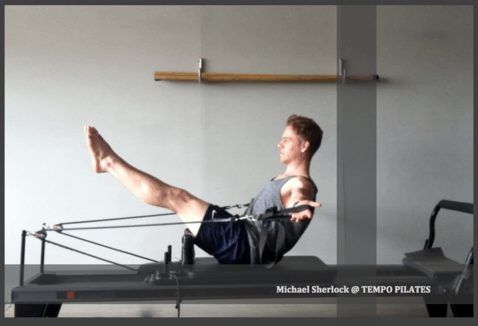 I go to Tempo Pilates who have studios in East and Central London and offer 1 hour and 45 minute Express classes on the Reformer. Personally I find their classes far more challenging than mat Pilates – as well as working with your own bodyweight you work against the tension of a set of springs on the carriage that can be adjusted to make the exercise more or less difficult. Much like picking up lighter or heavier weights depending on the muscles that you’re going to work out. And its not just the core that gets in on the action – arms, shoulders, legs all get a good workout through a series of different movements. I’m a big fan of their hour long classes but decided to break myself back in gently and try out my first 45 min Express Class at their WC2 studio. However, if I’d thought that shorter=easier then I was soon proved wrong. The trainer, Michael, took us through a series of exercises using all the different parts of the Reformer. Tricep dips off the platform, lunges while standing on the platform and using the carriage to move the front leg back and forward, moving side planks using the shoulder pads as footrests, boat pose off the side of the carriage and more. Towards the end of the session Michael challenged us to hold a plank with the carriage extended for as long as possible. I surprised myself by managing two and a half minutes before he told me I could come down out of the position! My core is without a doubt getting stronger. By the end of the 45 min class my muscles were shaking – I’d had a great workout and was sweating buckets and best of all my leg felt fine. Wobbly from the workout, but otherwise fine. After testing my legs out at the National Lottery Anniversary Run last weekend I think they’re ready to start full training again – they certainly feel a lot better which is great. But it’s also great to know that even if I can’t start full training for a few more weeks there are lots of things out there that I can do to keep moving towards my goals. How do you maintain your training when you’re injured? I periodically go through times when I’m not allowed to run b/c of knee pain so I always Love reading how others get through a non-running period of training! I’m super impressed with your creativeness! Sorry to hear about the knee pain. Annoying isn’t it? So what do you do to train when you can’t run?